The garden-fresh taste of gently cooked zucchini and cherry tomatoes pairs beautifully with the rich, hearty taste of salmon. Preheat oven to 425°. 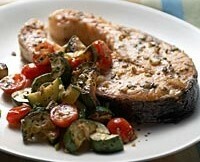 Place salmon in a small baking dish or ovenproof skillet; drizzle with ¼ teaspoon oil. Make the rub: In a small bowl, stir together mint, garlic, oregano, ¼ teaspoon salt, and 1/8 teaspoon pepper. Sprinkle half the rub mixture evenly over both sides of the salmon. Bake salmon until opaque throughout (about 10 minutes). Meanwhile, in a medium nonstick skillet, heat remaining oil over medium heat. Add zucchini, and cook, tossing occasionally until tender, 6 to 8 minutes. Stir in scallion, tomatoes, and remaining rub mixture. Cook just to heat through, about 1 minute. Season with salt and pepper; serve with salmon. Note: Once salmon steak is cooked, it's easy to remove the skin: Place a fork between the skin and the flesh at one of the ends; twist the fork (like you would with spaghetti) until all the skin has wound around it.